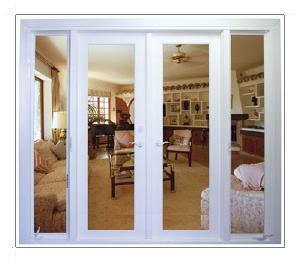 French Doors are appreciated by residents of homes and apartments throughout the country. Skip through any home interiors magazine and you are bound to find several pictures of living spaces featuring these beautiful doors. A permanent fixture in celebrity homes, 5-star hotels and private residences, you can add their beauty and functionality to your home even if on a tight budget. Where to Install and Why? They have their beginnings in the ‘casement doors’ used in rustic France which used two independently operable leafs of thick casement as doors. Today, doors have two symmetric panels of PVC which are hinged separately. Since the PVC panels are fitted with small glass windows through which light can pass, these doors are excellent for adding light to dark rooms. They also create the illusion of bigger spaces by adding the view from the other room to the view field. Lastly, these can be opened or closed to regulate traffic like when you are entertaining friends. Doors can be installed indoors as well in the exteriors. Inside the house, these provide passage between rooms like the living room and the lobby/kitchen. When you want to bring the outdoors inside, installing one of these doors in your patio area is the perfect solution. PVC is a synthetic polymer that is resistant to termites and environmental deterioration, unlike wood. Sometimes the very properties (space and light) of French doors that make them covetable can prove intrusive. Like when in the summers, when you want to leave them open but prevent mosquitos from coming inside or when you need to use air conditioning. PVC French doors are too beautiful to be forgone for these minor glitches and you can use window treatments to tackle them. Door screens made of clear plastic are ideal for rooms that need to be closed off for air conditioning as these don’t stop light. For indoor French doors, it may be necessary to stop the light from coming in the afternoon. These can be fitted with window treatments made of woven bamboo, voile fabric and lace. French window treatments are beautifully stylized and can be coordinated with your room’s interiors to achieve a synchronous interior design. These very popular doors did not gain mainstream popularity until well into the second half of 20th century. This was primarily because they are designed without a central jamb and hence were thought to pose safety concerns. Today, design and manufacturing technology has advanced significantly to make them as safe as jambed doors. If you want to add space, light or simply, flamboyance to your living space, these doors are your best bet.